Oh how I love sprinkle cakes! These whimsical cakes are the ultimate treat for the ultimate sprinkle lover! And I’m pretty positive you’re smitten with them too. So I must warn you that today’s post might induce some squealing! 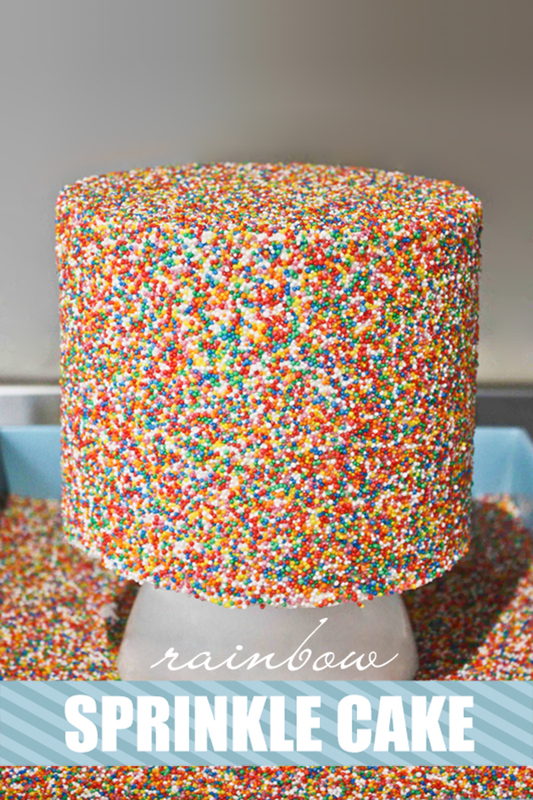 Kate Wagner of The Greedy Baker is sharing a fabulous sprinkle cake tutorial! YES! Step by step instructions and photos to help you create your very own sprinkle cake. Kate’s method is super easy and most importantly nice and clean. Packed with great tips and tricks to save you time and heartache… and spilled sprinkle mayhem! The end result is one spectacular sprinkle cake! It’s a DIY Rainbow Sprinkle Cake Tutorial!! STEP 1: Stack and fill cake layers, building your cake on one of the cardboard circles. STEP 2: Frost the sides of the cake with a reasonably thick layer of icing. Bring the icing over the top edge into the center of the cake and remove excess. We are not looking to frost the top of the cake at this stage. STEP 3: Using the cake lifter, lift the cake off the turntable and chill in the freezer for 15 minutes. STEP 4: While waiting for the cake to chill, pour the rainbow sprinkles into a large shallow tray. STEP 5: Remove the cake from the freezer and place the other cardboard circle on top of the cake. STEP 6: Using the cake lifter, lift the cake and gently lay on its side in the tray sprinkles. Supporting the cake with your hands on either side, roll until you have an even layer of sprinkles adhered to the buttercream. STEP 7: Place the cake back on the turntable. STEP 8: Spoon a generous amount of buttercream on top of the cake. STEP 9: Smooth evenly with the angled spatula, removing any excess. Chill in the freezer for 5 minutes. STEP 10: Place a small bowl upside-down in the center of the sprinkle tray. STEP 11: Remove cake from freezer and place on top of the bowl, being careful to balance the cake correctly. STEP 12: Spoon a large amount of sprinkles on top of the cake and smooth around to edges using the angled spatula, pressing gently as you go to make sure they adhere to the buttercream. STEP 13: Neaten up any missed areas around the edge using the spoon and spatula as shown. STEP 14: Admire your finished cake! This fun cake is sure to brighten up any day. Oh God, this looks so awesome! Thanks for sharing! Thats fantastic, I have a feeling your making it look easy!! Dont suppose you want to share you buttercream recipe?! Will give this one a go for sure. It’s up there, just click the buttercream link in the “Supplies” list. OMG Kate….I love your tute!! you make it look so simple…can’t wait to try this!!! you are AMAZING! LOVE IT!!! What a happy cake! What a fantastic looking cake! I’d love to see an picture of a slice with all the colored layers and the sprinkled outside! Just amazing! Oh WOW!!!! I love it! To me sprinkles are the glitter of the cake world and I love both! Thanks so much for sharing! I can’t wait to try this!!! Clever technique for getting full coverage on the sides! Ooh I was going to make one of these for my daughter birthday. I had bought 400gms of sprinkles which cost £12 do I really need 1kg that’s going to cost a fortune! I am so doing this soon!!! Thanks for the technique – I can apply this to lots of other cakes, too! I buy my sprinkles bulk for $10 a kilo. Normally I’ would only get a 100g for that much. It pays to shop around. Check out where bakeries and cafes get their supplies. Often these places are open to the public if they knew about it. Wow! This is awesome! It’s my daughters birthday in a couple of weeks and if I made this she would LOVE it! Will definately have a go. (might have to go and buy more sprinkles though!). OMG — What a fun, beautiful cake. It just makes you happy! What a wonderful tutorial. I can not wait to use your method. I have used sprinkles before and it was such a task to get the sides “sprinkled” and this looks so much easier and a much better application! Thank you so so much for sharing. I would also like to see a cut slice. I love tutorials and you are so nice to share. Thank you again. Looks very sweet. Someone who love sprinkles would get a kick out of this cake. great idea. I absolutely LOVE this cake! I have always wanted to know how to get a cake completely covered in sprinkles, and now the mystery is solved! I will definitely have to give this a try! One of my all time favorite posts and tutorials! So fun! I’m a fairly basic cook so I don’t have a clue on how you have produced this amazing cake. Is it possible for you to provide instructions and a method? Thanks. Love this. It reminds me of a rainbow cake I did too. I’m just curious if you’d share your cake recipe. Is it a pound cake? My cake recipe, although delicious and strong enough for my regular cakes, would fall apart if I rolled it on its side. To me, sprinkles are the herpes of the cake world. Lovely cake! Simple yet so fun and elegant! This is AWESOME! Congratulation, and thank you for sharing!